Excerpted from Edward F. O'Neil, "Seismic Strengthening of Hotel Oakland Revisited: A Case Study," The REMR Bulletin, Vol. 13, No. 2, May 1996, U.S. Army Corps of Engineers. Originally constructed between 1910 and 1912 with funds exceeding $3,000,000, the block-square hotel became a prominent social center during the next decade and was a control point on the Lincoln Highway. Presidents Wilson, Coolidge, and Hoover were guests at the facility, as were other celebrities, including Amelia Earhart, Sarah Bernhardt, Jean Harlow, and Mary Pickford. 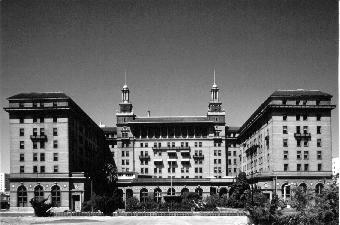 During the 1930s, the hotel was forced into bankruptcy several times as the result of the depression and management difficulties. In 1943, the U.S. Army took possession of it for use as a hospital. All furnishings were auctioned off, including irreplaceable chandeliers of which only photographs remain. Following World War II, several unsuccessful attempts were made to reopen the hotel for public use. The Veterans' Administration eventually occupied the facility as a hospital until August of 1963. For the next 15 years it stood vacant. In 1978 a Boston-based developer obtained possession and remodeled it into a housing project for the elderly. It remains in this use today. Currently, the exterior of the building and all two-story spaces on the main floor are on the National Register of Historic Spaces. These grand, ornately decorated rooms include the main entrance lounging room; the Corinthian-columned, 5,000 sq-ft ballroom; the dining room; and the cafe, which has 30 ft-high oak-paneled walls and a finely detailed plaster ceiling. Ed O'Neil is a research civil engineer in the U.S. Army Corps of Engineers.